your wednesday cliche…but it’s real. The crisp chill in the air can only mean one thing: time for pumpkin picking. (Okay, the chill in the air can technically mean a lot of things, but go with me on this one). yes, those are rings alllll over the bookshelf. and? Pumpkin picking was an annual tradition for my family when I was growing up and this was the first time my husband and I went together. The excitement started out on a hay ride (things have gotten fancier since the good old days). We were the only people sans children on the ride and I wondered if the parents looked at us with mild confusion (why aren’t these people still sleeping at 10AM if they don’t have kids??!) or envy as their kids threw hay at one another. No matter; hay rides and pumpkin-picking are, to me, like Disney World: an ageless endeavor, minus the hours of fun. And, the search was on. But, what were we looking for? my husband innocently inquired. The answer: The PERFECT pumpkin. Smooth, ability to stand up, not bruised…and so on. I began maniacally (word?) searching but none felt just right. Too flat. Too bruised. Misshapen. Too big. Too small. I finally spotted a gem with an incredible stem. In memory, I ran in slow motion to majestically claim it but reality would probably prove to be a brisk walk to pick it up. While there were some bumps and bruises, I was totally taken with its awesome stem. Like, how excited can you actually get about a stem, but I’m telling you…I really was. Something made me feel like this was “the one.” Upon further inspection, while the front was incredible, the pumpkin itself as a whole wasn’t that great on paper and certainly didn’t meet my checklist of perfection. I continued to search for a better one but I was so drawn to my uniquely-stemmed friend that I couldn’t bear to part with him. we all have a little something to hide. After an unnecessary amount of time scouring the patch, none of the pumpkins matched my expectations and I decided to keep the one I’d held on to. There was just something about that stem. “He’s not perfect, but I want this one,” I finally announced to my husband after giving up the search. “Sounds like something for your blog,” he replied. 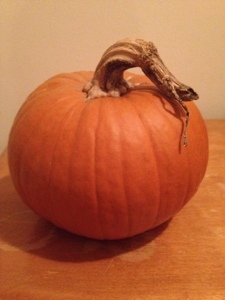 Seems so trite, like I was making this up for metaphor’s sake, but it really was true: I had been searching for the perfect pumpkin but ended up happier with my quirky one. 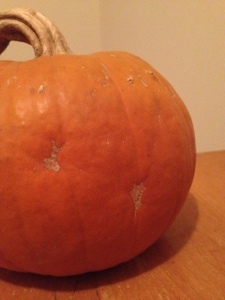 Back home, my pumpkin is proudly displayed by our door; imperfections, bumps and all.